Healthy forests are important to us for many reasons. 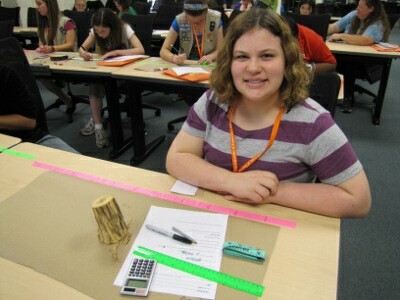 Forest scientists must collect lots of data to keep track of what is happening in our forests. In this module, students learn about the area and distribution of forests in the United States and why it is important to measure and monitor forests. One important measurement is DBH (Diameter at Breast Height), a measurement of tree trunk diameter. Scientists buy special DBH measuring tapes from forestry supply companies that are calibrated to use the tree trunk's circumference to determine its diameter through the relationship C = πD. Students learn about this relationship, then create their own DBH tapes and test them out on tree cookies. In another activity, students learn about stand density and then, pretending their classroom is a forest of people-trees, they apply this by measuring the stand density of their class "forest." The following activity is adapted from Biology in a Box. Stand density: the number of trees per unit area. 1. Using data from the FAO (Food and Agriculture Organization, part of the United Nations), ask students to calculate what percent of the United States’ land is forested. It is fun to have students guess what the percentage may be before they calculate it. Then the class can work together to find the percent, taking the area forested (in hectares), dividing it by the total area of the U.S., then multiplying by 100%. Is it more or less than they thought? 2. Next, ask students to think about what parts of the United States are forested, then shade in a map with their best guess. They can start by thinking about their own home state, places that they may have traveled or where they have family, or places that they have heard about. Feel free to ask some leading questions, such as: do you think there are a lot of forests in the Southwest? (This area has a lot of desert). What about the Midwest? (This area was once covered with prairie, but is now covered in farmland). What about up North? (This area is known for its beautiful boreal forests.) What about the southeast? (Forestry is big industry here). Also, students can take into consideration that earlier they calculated that the total area covered was about one third of the country. 3. Once the answer map is shown, the class may discuss how well their guesses match up to the real distribution of forests throughout the country. Are they surprised by any of it? Does anyone want to tell about a forest that they may have visited somewhere on that map? This map is especially interesting because it also shows the distribution of biomass, or mass of living material per unit area. The places colored in the darkest have the greatest density of biomass, the densest and most productive forests. Where are those areas? (Note that they are areas that get a lot of moisture and rain, due to their positions near coastlines or mountain ranges which trap rainclouds. In the Pacific Northwest there is actually rainforest!). 4. Now that we have an idea of how much forest is in the U.S., ask students why is it important to measure and monitor forests? Forests are important natural resources for our economy. Timber and pulp harvesting is a big industry in our country. We need to make sure we manage this resource so that it continues to provide materials we need for future generations. Forests are also important for recreation. As a society we value forests for their beauty and the opportunity to go out and play in them – hike, camp, even just drive through and admire the scenery. We also need to monitor forests for the sake of fire management. For years our society suppressed forest fires believing this was good for both the forest and for our property near them. But this led to a huge problem, as years of dead timber and brush piled up on the forest floors. When fires finally broke out, they were hard to control. Now foresters understand that occasional small fires are an important part of maintaining a healthy forest. And in areas where forest fires can’t be controlled, brush and dead trees are removed or turned into mulch mechanically. Monitoring forests helps us to predict what areas are at risk for bad fires. There are also several ecological reasons why we’re interested in monitoring and measuring forests. One is for wildlife habitat, protecting the biodiversity of all kinds of wildlife, insects and migrating birds that depend on forests, not to mention the diversity of plants, mushrooms, and other life found there! Another is that forests are important to air quality. Trees with large leaf-surface areas absorb nitrous oxides, sulphur dioxide, carbon monoxide and ground-level ozone, which contribute to air pollution. Also, on the other hand, our air pollution damages our forests, and it’s important to try to understand and lessen this damage. And finally, trees are important to the global carbon cycle, and therefore affect our predictions of global climate change. Deforestation has been a major contributor to global warming. If you look at the famous Keeling Curve depiction of the concentration of carbon dioxide in the atmosphere over the years, you see that the concentration of carbon dioxide is rising steadily. But if you look a little closer, you see the impact of plants on this “curve” -- its jaggedness is affected by the seasons in the northern hemisphere, as in the summer plants take up lots of CO2, and in the fall and winter many drop their leaves and die back, releasing the CO2 back into the atmosphere. This data was taken from an observatory in the mountains of Hawaii. There are many people studying forests for many different reasons like the ones above, and they go by many names. Some are called dendrologists, people who studies trees and woody plants. Others may be forest ecologists, who are particularly interested in the relationships between species in a forest or in the effects of management or pollution on the ecosystem. Tree physiologists are interested in how trees work on the inside, perhaps their health or how they work as an organism. 5. So, how do we measure a tree? What kinds of data can we collect? We see that trees come in all shapes and sizes, so how can we describe with numbers and data how they are different? One simple method is to break them down into their parts – trunk and crown (all of the branches). You can think of the trunk as being like a cylinder, and the crown like a big ellipsoid on top – not often spherical! Foresters have special ways for measuring tall trees with a clinometer, a special tool that uses principles of trigonometry. We won’t go into that here. But based on that, foresters can measure the entire height of the tree, the height of the trunk from the base to the crown, and the height of the crown. They also take width measurements, the width of the crown can tell us how much competition the tree has from neighbors (packed close together, the tree can’t spread out its branches as much to capture sunlight). Then there is the diameter of the tree trunk, the standard for which is Diameter at Breast Height, or DBH. Foresters prefer not to cut down or bore holes in trees if they don’t have to, so they measure DBH by wrapping a tape around the circumference of the trunk. Circumference isn’t the same as diameter, yet you can use one measurement to get the other. Ask your students, how is this possible? 6. As students practice using the equation C=πD (circumference equals pi times diameter), have them pay special attention to the last question: “For every 1 inch increase in diameter, the circumference increases ~3.14 inches.” Then ask, is there a way to invent something that when you wrap it around the circumferen ce of a tree or something else round, it automatically gives you the diameter? At this point distribute the flagging tape, markers and rulers. Have students measure and mark off increments of 3.14 inches as illustrated. Pi is actually an irrational number meaning that the numbers following the decimal point never end. It starts out 3.14159 … but here we will estimate it to be about 3 and 1/8 inches. It helps to walk around the class with an already-made tape and compare yours to theirs to make sure they are on the right track. DBH tapes, as they are called, are commercially available to foresters as a tool they use in the field, but they work exactly the same way as the ones your students make. All of these activities were designed for indoors, but would be twice as fun if students have the opportunity to go outside on school grounds to test out what they’ve learned on real trees. An additional fun activity would be for students to collect and tabulate DBH data on all the trees on their school grounds and perhaps use that data to practice finding the mean, median and mode.